With warmer weather just around the corner we're feeling ready to shed our heavy winter clothes. 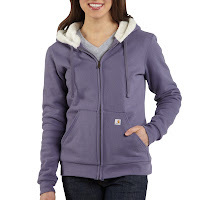 Carhartt has items for men and women that will help us ease into the warmer weather. To see detailed information, including price, on these and other items, please click on the "online store" button at the right. The Camden Wool Hooded Parka in winter white is warm enough to keep out the winter chill but with a decidedly "heading into spring" look and feel. 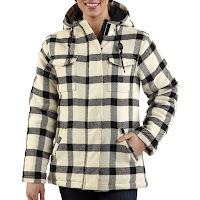 It is made from 16 ounce 50% wool/50% polyester and lined with Carhartt's arctic quilt lining. Heavier than a sweatshirt but lighter than a winter jacket, the Sherpa Sweat Jacket has an 80% cotton/20% polyester shell and a 100% cotton lining. 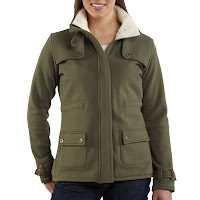 The sherpa lined collar is stylish and snuggly. 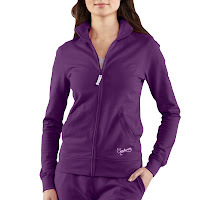 It has a metal zipper, drawstring waist for a stylish fit and button flap pockets. It's just the right weight for those days when there is still a nip in the air but the winter chill is definitely fading. A little lighter than the Sherpa Sweat Jacket, but definitely a heavyweight sweatshirt, the Sherpa Hooded Sweatshirt is made with the same 80% cotton/20% polyester outer and 100% cotton lining with a 100% polyester sherpa lined hood. It has a metal zipper front and two front pockets. The lightest of the group is the women's Track Jacket. Made from 95% cotton/5% spandex french terry it's a midweight sweatshirt with a full length metal zipper, two front pockets and no hood. The sherpa lined Denim Jean Jacket combines traditional jean jacket styling made from 11.74 ounce 100% cotton denim with sherpa lining in the body and quilted nylon lining in the sleeves. It has a button front and button-adjustable cuffs and waistband. 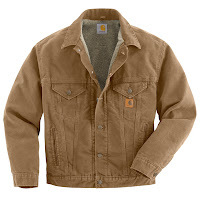 The Duck Jean Jacket has the same styling but is constructed with a 12 ounce 100% cotton sandstone duck outer layer. The Soft Shell Hydrid Jacket is a new style from Carhartt and the perfect weight for going from winter into spring. 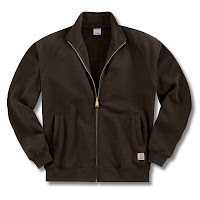 The lower garment is made from 8.5 ounce 94% polyester/6% ripstop nylon bonded to a polyester grid-textured fleece. 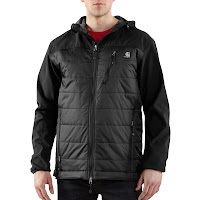 The upper garment is made from 100% nylon quilt. It has a durable wind and water resistant finish. There is a media port in the upper left inside pocket. It's lightweight but warm and breathable. The men's mesh lined Sandstone Active Jac has a 100% cotton shell, with 100% polyester body and hood lining and 100% nylon sleeve lining. It's lightweight but tough. Just the right weight for spring layering. The Thermal-Lined Hooded Zip-Front Sweatshirt was our best selling men's jacket/sweatshirt last year and so far this year. It is made from 12 ounce 50% cotton/50% polyester (no shrinking) with a 100% polyester thermal lining which retains warmth. It has a full length brass zipper. It has the same warmth factor as the mesh lined sandstone Active Jac but is softer and more flexible. The Midweight Mock Neck Zip Front Sweatshirt is lighter weight and without a hood. It is made from 50%Cotton/50% polyester, has a mock neck collar, raglan sleeves and a full length antique finish brass zipper with a storm flap. Finally, the Flannel Lined Canvas Shirt Jac is one of the most versatile articles of clothing on the market. 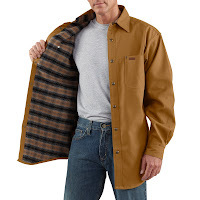 Made from 9 ounce 100% cotton canvas with a 4 ounce 100% cotton flannel lining it is both warm and tough. Some of our customers wear it as a shirt in the winter with a tee shirt under it and a jacket over it. Others wear it open over a flannel shirt or a long sleeve tee. Either way it looks good and lasts. All of the above styles can be found in our Santa Fe store or at our online store at www.barndogs.com. Sizes or colors that are not in stock can be special ordered and take approximately 10 days to arrive. 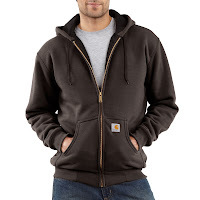 Items can also be drop shipped directly from Carhartt to your home or to a third party.